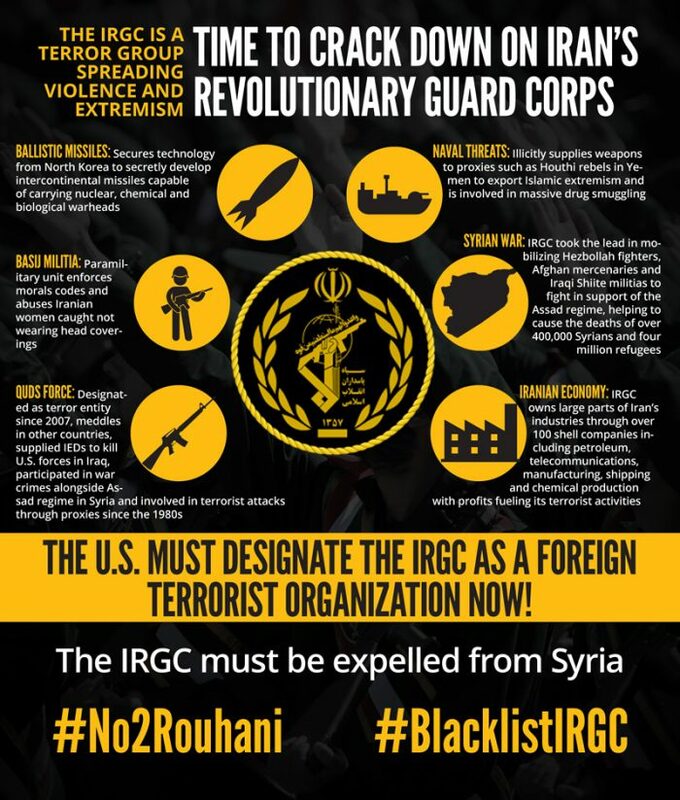 The infographic explains why the Islamic Revolutionary Guard Corps should be black listed. On Monday, the United States government may officially designate the Islamic Revolutionary Guards Corps (IRGC) as a Foreign Terrorist Organization (FTO), coming at the end of months of debate and negotiations. The unprecedented move is another step in the Trump administration’s crackdown on the Iranian regime. Mrs. Maryam Rajavi, President-elect of the National Council of Resistance of Iran (NCRI), has called for years the international community to blacklist the IRGC and to end its policy of appeasement toward the mullahs’ regime. On January 11th, Mrs. Rajavi called for the United States to list the IRGC as an FTO. The IRGC is a military force that answers only to the regime’s Supreme Leader. Since the mullahs seized power in 1979, the IRGC has played a major role in the suppression of dissent within Iran and the regime’s exportation of terror. The IRGC is now one of the most powerful entities within Iran, influencing the economy, the regime’s nuclear and ballistic missile programs, and its terrorist operations. During his tenure at the Central Intelligence Agency, U.S. Secretary of State Mike Pompeo notes that IRGC-affiliated companies control approximately twenty percent of Iran’s economy. Mike Pompeo and National Security Advisor John Bolton have both praised the designation as a measure that will apply additional pressure on the ruling regime in Iran. Bolton Bolton has spoken in support of the MEK and the Iranian Resistance on several occasions and has supported efforts to end the Western policy of appeasement toward the mullahs. U.S. President Donald Trump is also firmly in support of the new terrorist designation, which is in keeping with his policy toward Iran. Policy experts say that the impact of the move will be significant. The United States Central Command (CENTCOM), which oversees all U.S. forces in the Middle East and North Africa, is bracing for the possibility of retaliatory attacks against troops stationed in the area. Commanders are currently deciding whether to issue a regional warning to troops in the area as a preventative measure. Over the past forty years, the IRGC has engaged in both domestic and international terrorism. The IRGC continues to violently crack down on protests and dissent within Iran, firing live rounds into crowds of people, conducting mass arrests, torturing detained protesters, and violently assaulting peaceful gatherings. The 1983 Beirut Bombings, which killed more than 240 United States Marines inside their barracks. The IRGC trained and funded the terrorist Lebanese Hezbollah group who carried out the attack. The 1992 bombing of the Israeli embassy in Argentina. The 1994 AMIA bombing in Argentina. The 1996 Khobar Tower bombing in Saudi Arabia. The killings of hundreds of American soldiers in Afghanistan and Iraq. Funding, training and equipping proxies in wars in Iraq, Syria, Yemen and Lebanon. The designation of the IRGC as a Terrorist Organization will strengthen the ability of the U.S. to take practical measures against the group and the many individuals and companies associated with it. Previous actions taken by the U.S. Treasury were limited in their ability to take on the vast network of entities associated with the IRGC. 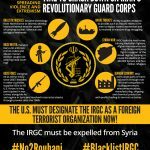 Once an organization is designated as an FTO, all individuals and groups are banned from providing support of any kind, including financial services, equipment, specialist advice, or arms or transportation equipment, to any IRGC-controlled entity or IRGC official. Anyone found in violation of the designation could face civil and/or criminal penalties.